Gift certificate — is not just an original gift, but a whole set of impressions! A gift certificate is the perfect Declaration of love, the best compliment an unsurpassed experience and a unique drive.All the adventures that are included in gift certificate, is absolutely safe, since next to you will be professional instructors. Gift certificate can choose from, based on the estimated interests and age of the person to whom it is intended. A gift certificate is a perfect gift for family and friends on their birthday. Universal and the perfect gift for any man will be a gift certificate for a swim with the dolphins, since such an adventure will bring a lot of positive emotions and unforgettable impressions. Gift certificate for swimming with the dolphins is a great gift for the health, as the close association with these marine mammals is beneficial to the mind, improves metabolism and blood circulation in the body. Therefore, a gift certificate for swimming with dolphins can rightly be called "health ticket". Gift certificate for swimming with the dolphins is a perfect romantic gift. Together with his second half you can swim and play with dolphins. This will make your relationship to novelty and new bright colors. An excellent choice would be a gift certificate for swimming with dolphins as a gift to the woman he loves. Your wife, sister, mother, friend, co-worker will be able to swim with these amazing animals, play with them, to relieve stress, enjoy life. As a wedding gift are ideal gift certificates for a swim with the dolphins. Imagine how nice it would be to start a life together with such a memorable adventure. Swimming, swimming and socializing with dolphins - a specially organized program when you are not just in the water next to the dolphins, and feel in the role of coach. After five minutes of instruction, you descend into the water. Dolphins will play with you, roll over the fins on the belly, to waltz with you in the same way as on the ideas with the coaches. Friends and loved ones at this point you can take pictures and shoot video. Bathing takes place in bathing suits, the coach can provide you with a wetsuit of your size if necessary. Children are children oversleeves or jackets. Photos with the dolphins — it's a great opportunity to capture on film a touching moment of the meeting with the unique animals - the dolphins! This is one of the best gifts that will appeal to both children grown, it's emotions and memories for a lifetime! Photos with dolphins in the water, the dolphin will substitute its fins, swim with You 1 big circle around the perimeter of the pool, our photographer will take a picture of You and the gift You will receive a photo large size (A4 format). Photographing with the dolphins will leave an unforgettable memory in the positive emotions from communication with these amazing marine animals. Diving with dolphins — a dive with a full set of equipment and an experienced instructor under the water to the dolphins. The dolphins you will be met by experienced diving instructor, who will pick up and will give you a set of equipment for scuba diving, conduct training and descend with you into the water, where you will spend 30 unforgettable minutes with the dolphins. Admitted to diving everyone between the ages of 9 to 50 years (after consultation with the diver). The show with dolphins is an unforgettable show for children and adults! 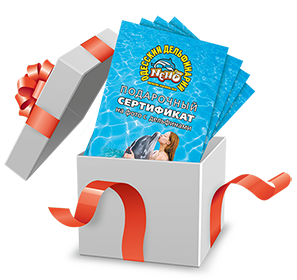 Gift certificate for the show in the Dolphinarium Nemo will be the wonderful gift for any holiday or important event. Having presented such certificate to the dear and close person, you present not just a thing, but real and sincere emotions. Why is that? It's simple! Dolphins have an amazing ability to give joy and positive emotions in just a moment! Amazing dolphins, funny sea lion and funny fur seals, along with their coach, perform incredible entertainment and beauty effects. Jumping in the air, playing with the ball, graceful pas on the platform (break dance, lambada and waltz), water-color drawings from dolphin, this and much more awaits you at the day show in the Dolphinarium Nemo! On Saturdays you can enjoy a terrific romantic night show. 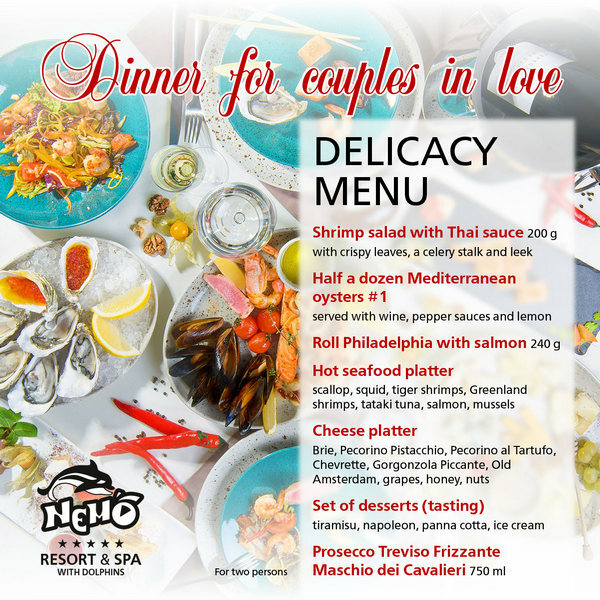 Sounds of the charming saxophone, show ballet, acrobatic duet, water ballet, acrobats, fire and laser show, stunning fireworks - all this will dip you into an atmosphere of incredible romance and love! 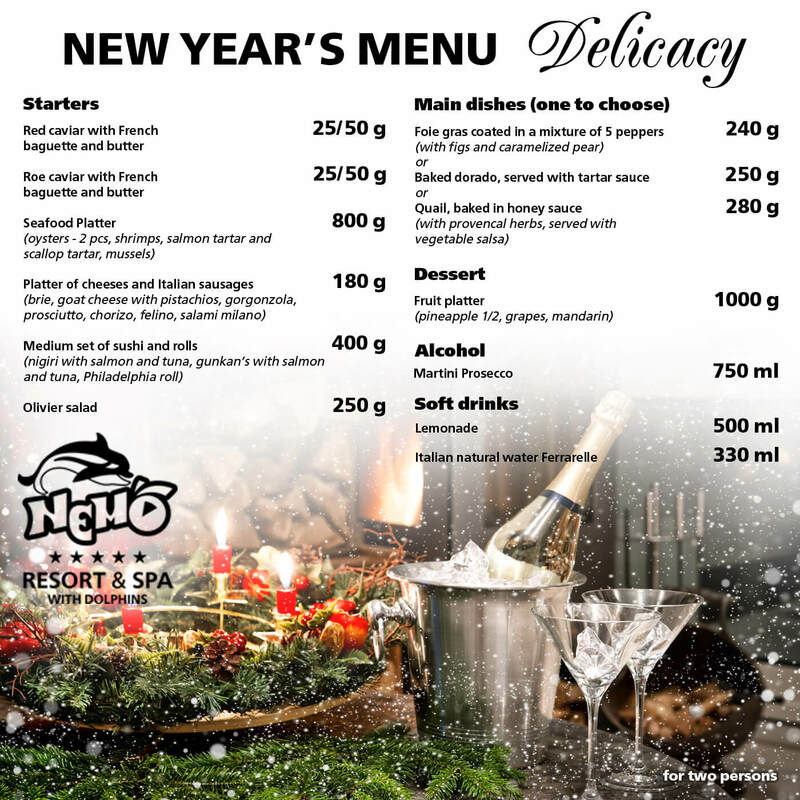 At any age and at any time of the year, the Nemo Dolphinarium will give you the wonderful mood and fabulous emotions. Memories of the spent time here will s in your heart forever! Dolphin Therapy — is a specially designed Wellness program for You and Your children. Dolphins doctors carefully, will communicate, play, and, of course, will give you a real pleasure riding on the waves of our pool. Friends and relatives will be able to make photos and shoot video. +38 (048) 705 70 71. Requests for delivery of "day" will be accepted until 15.00 of the day. Delivery is carried out from 16.00 to 20.00. Shipping cost within the city - 200 UAH.